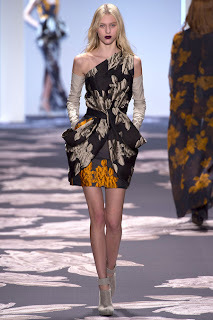 It's hard not to notice that flowers, and especially, overblown, statement making rose prints, have found their way into the Mercedes Benz fall 2013 collections. They were one of the major statements at Thom Browne's eccentric runway show held on Monday evening (I couldn't help but speculate, knowing Thom, that maybe one of the more exaggerated of the group is what he really wanted Michelle Obama to wear for the Inauguration, rather than the subtle and very establishment pinstripe ensemble she selected- LOL). (By the way, as I'm writing this, the First Lady is appearing with the President, in conjunction with his State of the Union address, and she's wearing a wine and black dress, and I'm sipping a glass of wine). In any event, yesterday morning, roses were also a major part of Vera Wang's collection (where they looked especially beautiful when the colors (ivory, tangerine, fuchsia) were mixed collage style, within one dress. Though Raf Simons didn't invent roses, I guess you can say he re invented them and made them look modern and youthful, using them as he did for his highly acclaimed freshmen outing for the house of Dior, for spring 2013. Overblown roses were one of his signature statements on the runway, and they were an editorial favorite, picked up across the board. Anna Wintour even wore one of the most photographed versions (a mid calf ball skirt paired with a fitted black long sleeved top), when she attended Bergdorf Goodman's 75th anniversary party at the Plaza last November. 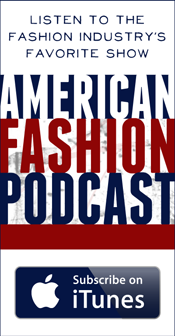 As we all know, everything that comes around, goes around, and fashion is like one big dysfunctional family ( I've been involved in fashion long enough to qualify as an expert in these things). It's hard not to go through a new fashion cycle, or any fashion week for that matter, without thinking about how everything and everyone is somewhat related (fashion's answer to 'Six Degrees of Separation'). And so, because Dior was on my mind, I also had John Galliano on my mind. A bonafide creative genius with a few too many demons, as we all know, he was unceremoniously fired from his creative role at the house of Dior in 2011, after making rabid anti Semitic remarks (he testified in a Paris courtroom that an addiction to pills and alcohol kept him from recalling any alleged use of anti-Semitic and racist slurs on two separate occasions at a Paris bar). Enter longtime friend and supporter, Anna Wintour (the powerful editrix recently 'arranged' for him to get back to design, via Oscar de la Renta and she was sitting in the front row, wearing head to toe burgundy). I don't think it's an understatement to say that the Oscar de la Renta fall show, held at two back to back presentations at his 42nd street showroom last night, had to be one of the most highly anticipated of the season, and had the fashion world buzzing. There were and still are, many unanswered questions and much speculation, regarding John's exact role, but let me just say that I personally see the 'fit', and think the two designers share a somewhat similar aesthetic (ultra couture like, ultra feminine). And unsurprisingly, the collection was a little of both: there were plenty of Oscar's signatures ( the toile de jouey prints, the gold bouillon scroll and bead embroideries; the strong colors). But there were also obvious touches of John: the muted somber shades (wine, aubergine, black, anthracite), the draped coats and coat dresses; the hooded capes; the Ginza jackets; the English eccentricity and edginess; the exaggeratedly attenuated, ultra skinny silhouettes; the exaggerated tall cloche hats (Patricia Underwood). But when the show was over, only Oscar came out on the stage. I actually did not see John at all last evening, although apparently, he attended the show, dressed like a "Hasid" complete with long jacket, hat, and curly "peyos", according to today's The New York Post (it was their cover story, 'Shmuck! Jew-bash designer's costume mocks faithful'). I was in a crowded elevator going down, and I overheard a show attendee remark to her companion, "That was one of the most schizophrenic shows I've ever seen. Was it Oscar's dress, or John's suit?" I think that pretty much summed it up. Hey isn't Dennis Basso that guy who makes sable furs? Upon viewing this collection it is apparent this is only one, albeit major, element of a breathtaking collection. Dennis Basso, 57, started his business in 1983 after selling a line of pelts out of the trunk of a rented town car. He now caters his collection including couture furs to the social set and movie stars- he is sort of a modern day Bob Mackie. This collection was lush, magnificent, and astoundingly beautiful. The only bad part of the show was its' conclusion - all that beauty gone behind the stage and the harsh mundaneness of life creeping back in. However, to be transported to this luxurious world even for just ten minutes was intoxicating. ﻿﻿﻿﻿﻿﻿﻿﻿The show was held at the stage in Lincoln Center befitting the stagelike elegance of the collection. Basso is celebrating his thirtieth anniversary in the business and he said this "collection is a tribute to the great American fashion icons. 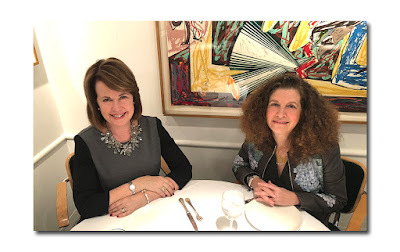 Women such as Babe Paley, Gloria Guinness and Millicent Rogers who embody the glamour, strength and elegance that has inspired me throughout my career." Very few designers could get Joan Rivers, Joan Collins, Martha Stewart, Star Jones, Kelly Bensimon and Carol Alt to sit front row with excited anticipation. I asked Star Jones what makes Basso so special and she stated, "almost every fur coat I have is designed by Basso. He is my go to person for fur and gowns. When I attended the Obama inaugural ball the first time I wore one of his gowns." Hal Rubenstein, fashion director at InStyle magazine said, "Dennis designs clothing for women who are ready for joy and sunshine. He gives you clothing to enjoy a happy, luxurious life." ﻿ ﻿Midnight hand layered organza and velvet gown covered with a slate blue alligator vest. ﻿ ﻿﻿The collection opened with a french grey mink and sable coat with a tulle hand embroidered dress (see lead photo). The delicacy of the dress against the lushness of the coat was a beautiful contrast. Throughout the collection fur and alligator were transposed over intricately embroidered dresses elongating the dresses and highlighting the coats. 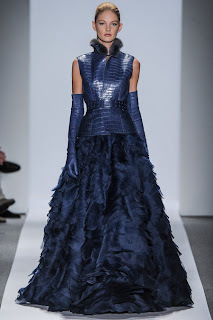 Alligator appeared in shades of gray, blue, and evergreen perfectly fitted to the models torso and oftentimes on top of the gown giving the illusion that it was the bodice of the gown. While fur might be the specialty of Dennis Basso his dresses were some of the most beautiful I have viewed. Many of the dresses were plaid and taffeta however, they were so soft and ladylike they removed any notions of dullness normally associated with plaid. The dresses made of tweed were so intricately woven they did not in any way resemble the tweed my grandfather wore. My favorite gown was the midnight hand layered organza and velvet gown covered with a slate blue alligator vest. The model sashaying down the runway looked like one of the characters in the Great Gatsby. The flow of the dress was heavenly, accompanied by long leather gloves and a fur collar - it doesn't get better than this. However, I would be remiss not to mention the furs which came in multiple colors and were of the chinchilla, sable and lynx variety. The richness of the colored furs were outrageous; the lynx belly parka over a taffeta plaid pant evoked images of an eskimo with too much money to spend, yet its' efffect was startling. It was soft and smooth and looked comfortable, decadent and divine - I still have its' image imprinted in my head. Dennis Basso has a justifiably devoted following among the society doyennes of New York. He has many acolytes who buy his coats year after year and attend his shows with cultlike enthusiasm. However, at the conclusion of this showstopping collection the plaudits were few - this confounded me was I missing something? Then it occurred to me that this audience is surrounded by beauty with such regularity they were anesthetized to the magnificence of this collection. Anti-aging skin care without the irritation that can be associated with Retinol treatments. StriVectin-AR combines Retinol with a patented form of Niacin to strengthen the skin and prevent sensitivity and inflammation.